I have made half of the pops I need for this weekend and all the free coffee give away bags are ready. It is going to be a great weekend and thankfully the weather predicted is gorgeous! This Saturday and Sunday are serious pop days for me! Saturday evening there is a community dinner to the tune of $60 per head where chefs and companies from all over the area will each be passing out their products at the beautiful Peterloon estate. I am giving out mini pops for dessert in blueberry basil and lavender lemonade flavors. My husband will also be giving out small bags of coffee and coffee samples. This is a great opportunity for us to spread our name and we are very excited! On Sunday is an amazing event called the Green Market put on by Edible magazine at the beautiful Ault Park. There will be 60 vendors, free classes on sustainability, farming, and lots of great food! The weather is predicted to be gorgeous! It is from 11 to 5 and I would love to see you there! This is the first event I will be at where there will be another pop company there, and I need all my faithful supporters to show up! If you are looking for a great free event this weekend, come check us out. Carabello coffee will be there as well serving the best cold brew coffee you have ever tasted! In other news, the shop is coming along! The plumber was there today, the masonry guy fixed the wall, and the zoning department has approved us to go forward with the rest of the build out. Hooray! A friend sent me this article this week about the best pop molds for home use. I found it to be pretty interesting so I thought I would share! I especially agree with their comments about the size of the pops. When they get to be three ounces and above they are too big to enjoy the last few bites. Thought I would share a few photos from the parade last night. Good times had by all. This week in pop land! 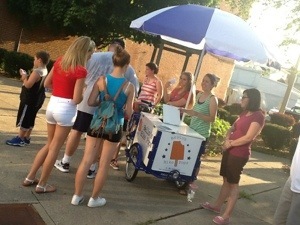 Tonight I will be at the Norwood day parade at seven giving away free pops compliments of Life Church Norwood. Everyone loves a free ice pop! Hopefully the rain will hold off until we are done. of town. It is going to be twice the size of last time and promises to be a ton of fun! Our shop is coming along and we hope we can have a soft opening the last week of August. 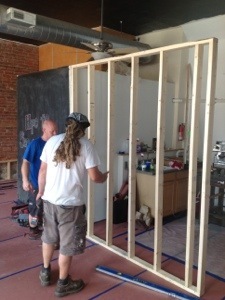 Here you can see them building the wall where the pop menu will be! There are two big events I wanted to make sure you know about! The first is the Oakley Fancy Flea which is going to be twice the size of last time, and hopefully without the afternoon monsoon. It was so fun last time, and I really look forward to it again! July 27th 10-4pm. Make it a family affair! 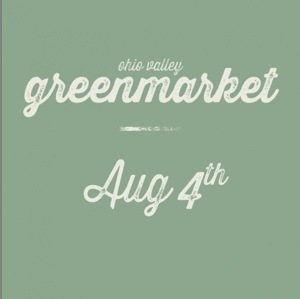 The second event is the Green Market, put on by Edible Magazine. There will be over 60 vendors, and it will be held in beautiful Ault Park Sunday, August 4th from 11-5pm. I would really love your support on this one as well, because….there will be another pop company there! I have never been at an event with someone making the same type of product as I am, and I would love to have my friends come and see me there! 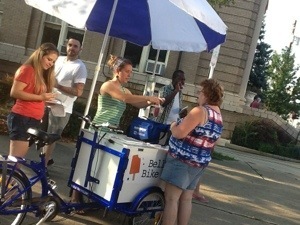 We took the pop bike up to the Newport swim team meet tonight and had lots of fun despite the incredible humidity. I really love meeting so many different people. It is the best part of the job!